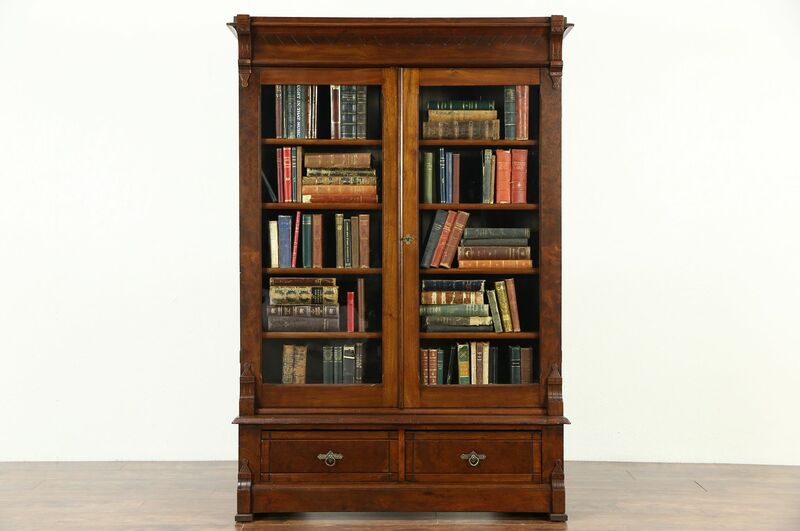 A late Victorian or Eastlake period bookcase from about 1875 is solid walnut with burl panels. The renewed finish is in excellent condition, preserving warm antique patina and just enough mars and losses at the edges for a little antique character. Doors have original wavy glass, shelves adjust on wooden supports. The key is a handle only, the lock does not work. Drawers have hand cut dovetail joints and original brass ring pulls on this American made library furniture. Size is 47" wide, 18" deep and 68" tall.